It was an impromptu decision to meet up over coffee at Tiong Bahru estate enclave on a Monday afternoon. 40 Hands, Plain Vanilla and PoTeaTo along Yong Siak Road were not opened. And we wanted to munch on something more substantial than just cakes, pastries and tarts. Having tried Tiong Bahru Bakery and PS.Cafe Petit before, we decided on The Dispensary. 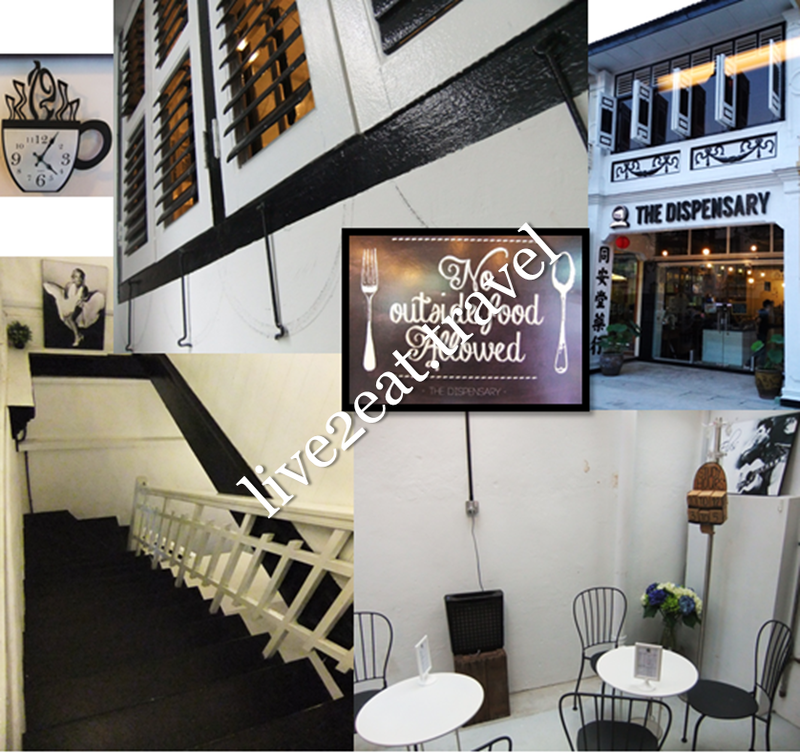 Located along Tiong Bahru Road, it could be seen from the main road unlike most of the cafés in this neighbourhood. But it did not have parking spaces at its doorsteps like say, Drips Bakery Café and The Orange Thimble. Occupying the space where an old Chinese Medical Hall dispensary used to be, black words stood out against white walls outside and the same monochrome colours could be seen inside too – black and white lourve windows, at one of the staircase and black chairs paired with white tables. Stepping into this refurbished space with an all-glass frontage, I saw old wooden shelves and medicine cabinets that used to house Chinese herbs on my left. 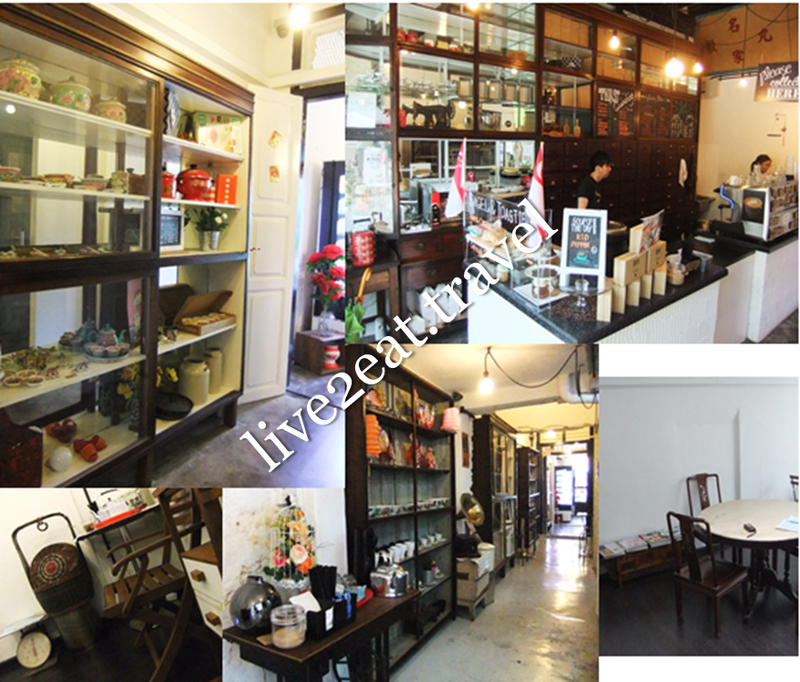 The former could be seen throughout the charming two-storey shophouse displaying antique-looking sewing machine, clogs and oriental crockeries among others – all, together with traditional Chinese weighing scales and old murals, retained without being out of place. To the right, cookies sat pretty in glass jars on a display fridge with cakes and cupcakes. Written with white and coloured chalks on blackboards, the menu included salads and sandwiches as well as all-day breakfasts and pastas. Soup of the day, bagels and toasties were also available. Interestingly, both Americano and Long Black were offered. I understood them to be pulled shots of espresso diluted with hot water to upsize the tiny cup to a regular one. Found out from the barista that their difference lay in the sequence of which was added to what. Confused, I just requested for the one that had water added to coffee while my dining companion ordered a cappuccino. My drink was served in the exact same glass as kopi-o from local coffeeshop but at a few times the price. Could smell a faint aroma of roasted beans in the smooth cuppa with muted acidity but it was not strong enough for my liking. We also shared a medium (comes in small, medium and large portions) smoked duck pasta, which instead of being served in a deep dish with metal fork and spoon, came in a ceramic bowl with chopsticks and ceramic tablespoon that reminded me of dry mee pok at a fraction of the price. Oh well, at least the linguine done aglio-olio style was al dente and not too oily with a tad of spice and meaty slices of smoked duck.